Brexit backers claim U.K. is drowning in EU regulations – are Americans underwater too? On June 23, the United Kingdom will decide whether to leave the European Union or stay. The vote is nicknamed Brexit, short for British Exiting. One reason the debate is important outside of the U.K. is that it is partly a referendum over the amount of government regulation voters want. Many people wishing to leave cite concerns about the EU imposing unfair, onerous and growing amounts of regulations. Boris Johnson, the ex-mayor of London, has become a chief spokesman for leaving. He argues remaining in the union subjects British businesses to thousands of costly new EU regulations each year. However, the “stay” and “leave” sides do not agree on the specific number and costs. That got me thinking: Is “overregulation” becoming a problem in the U.S.? What’s regulation’s real cost to business, both in terms of money and innovation? How important is regulatory reform, and is it hopeless, as some commentators claim? A rapid growth in regulations is not occurring just in Europe. It is also happening in the U.S.
Below is a graph of the number of pages published in the U.S. Code of Federal Regulations, or CFR. The CFR is the compilation of the administrative rules enforced by the federal government. The page count is not a perfect measure of regulation for two reasons. First, it excludes state and local rules. Second, some rules and regulations need more words than others. Nevertheless, it is currently the best approximation available and is monitored both by Congress and many outsiders. 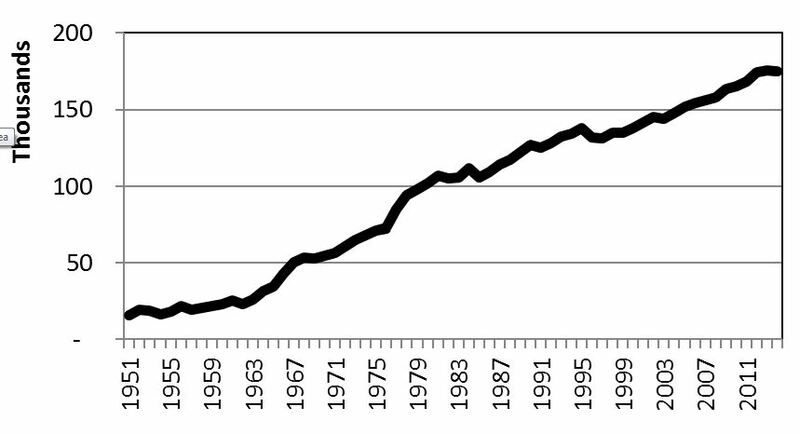 The graph shows that the U.S. has experienced a dramatic growth in regulation, with the amount of pages increasing by a factor of nine since the 1950s. It also shows that neither Republicans or Democrats are immune to the charge that they are imposing more rules and regulations. There is a steady march upward regardless of which party occupies the White House. Many presidents, starting with Richard Nixon and continuing through Barack Obama, have tried to reduce the number of regulations or their burden. One attempt was the 1995 Paperwork Reduction Act. This act had a small success, with about 6,000 CFR pages cut – about four percent of the total at the time, from 1995 to 1996. Nevertheless, reductions are relatively infrequent. Since 1950, the number of pages has grown on average by five percent a year. Given the growing volume of regulations, it’s reasonable to ask whether we even need them. The easy answer appears to be yes: Regulations are important in modern life. Society is complex and every country needs rules to help govern and ensure order. Moreover, power is not shared equally in modern society. Regulations have the ability to protect the weak and powerless by requiring all to follow the same set of rules. For example, very large companies cannot use their power to pollute the land and water without running afoul of regulations throughout the world. There is clearly a need for rules and regulations. However, the Brexit debate points out that many people in Briton feel overregulated, which is when the costs and burdens imposed by regulations outweigh their benefits. Overregulating society increases the cost of companies to do business because such rules act as a hidden tax. These extra costs are often passed on to customers. Elsewhere in the world, the costs of regulations can be even higher. The World Bank ranks countries on various measures of starting a new business, such as the cost of regulations and time it takes to begin operating. In 10 countries (mostly in Africa), the average cost to start a business is equivalent to at least 100 percent of national income per capita, compared with just 3.2 percent in OECD countries. The time it takes to comply with regulations can also differ dramatically, ranging from just half a day for the fastest country (New Zealand) to 144 days for the slowest (Venezuela). Researchers have still not clearly determined if regulations help or hurt innovation. Regulations clearly prevent some activities from happening. For example, a recent Wall Street Journal article argued FAA regulations on supersonic aircraft noise over land has prevented a new class of small quiet planes, which could travel from L.A. to New York in 90 minutes, from developing. However, regulations potentially spur innovation as competing companies search for improved ways to do business. The Porter Hypothesis suggests environmental regulations might enhance competitiveness by forcing companies to view pollution as costly waste. When regulations put a price on pollution, companies innovate to reduce this waste. This makes the company more efficient and society better off. Whether or not the Porter Hypothesis happens with environmental laws, it is clear government regulation of taxi companies has spurred dramatic innovation in transportation by ride sharing companies like Uber and Lyft. Concerns about overregulation will remain, no matter what British voters decide on June 23. Regulations are needed in modern society, but simplifying rules and eliminating outdated regulations would address many concerns highlighted in the Brexit debate. Simplification is important because reading and understanding regulations is often exceptionally difficult even for people who are experts. Many large organizations now hire chief compliance officers, who are individuals devoted to ensuring the company does not run afoul of regulations. Even the U.S. government recognizes simplification is needed. It has a Plain Language Initiative encouraging government agencies to write future rules, regulations and documents in simple words. This initiative, however, only deals with new work and has no penalty for noncompliance. It is impossible to expect people to follow rules they don’t understand. This means all regulations must be clear to people with average knowledge and intelligence. I shudder to think how key rules like the Ten Commandments would be written or be followed if they were composed in regulatory language. Provisions must also be made for eliminating out-of-date rules. Governments create rules and regulations but typically don’t eliminate them when the concern addressed is no longer relevant. This issue was recognized by the U.S.‘ founding fathers. In a letter Thomas Jefferson wrote to James Madison, he actually suggested 19 years should be the maximum length of time for any law. There are many examples of regulations in the CFR that are ready for retirement. For example, a statute regulating switchblade knives was passed a year after “West Side Story” appeared on Broadway. The play and subsequent movie contain a violent scene in which a gang member stabs a rival with a switchblade. The prohibition against the manufacture and sale of switchblades is quaint in today’s society, in which worries about violence are focused on guns, and tactical knives have their own Amazon shopping category, available for immediate delivery. In my view, one simple method of improving the problems is to set a fixed limit to the number of pages of regulations. The U.S. CFR is currently over 175,000 pages. Setting a hard limit at 175,000 pages would force government agencies thinking about making new regulations to either eliminate or simplify older regulations to make space for new rules. Politicians in the past have campaigned on platforms of not raising taxes and balancing budgets. A platform of fixing the number of pages of regulations might be just the ticket for stemming the anger about overregulation that has fueled the desire of many Britons to leave the EU. Posted by Jay Zagorsky at 9:37am June 20, 2016 Posted in Macroeconomics and tagged Brexit, CFR, Code Federal Regulations, laws, regulation, rules. Bookmark the permalink. ← Was the May 2016 Jobs Report Really That Bad? I think regulation is necessary but do you think society will start to become over regulated?